For the fit population, weight scales and Body Mass Index calculations do not give a true picture of your fitness level and changes brought on by exercise. Body composition is a ratio that relates your fat-free mass to your fat mass, and provides a more accurate means of assessing your progress. You can use the formula for body composition to fine tune your body weight to its optimal body fat percentage. Your body's fat mass consists of two components, essential fat and storage fat. Essential fat is necessary for vital metabolic functions including organ function, the conduction of nerve impulses, reproductive function and other crucial roles. Storage fat is located around internal organs, within muscle tissue and directly beneath the skin. It provides insulation and protection for vital organs, and is a ready fuel source for aerobic energy. 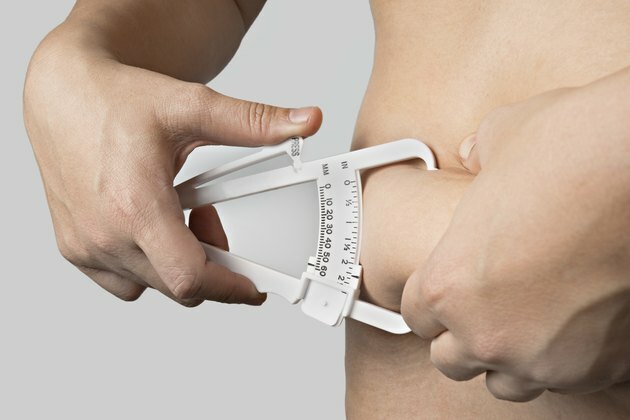 Your lean or fat-free mass represents the weight of your muscles, bones, connective tissue and internal organs. Higher lean mass is associated with higher metabolic activity and greater caloric expenditure throughout the day. There are a number of ways to measure your fat mass, and some are more practical and inexpensive than others. Hydrostatic weighing is a procedure that dunks you into a tank and weighs you under water, the premise being that fat mass is buoyant while lean mass sinks. Hydrostatic weighing is considered the gold standard for body composition, but it is expensive and inconvenient for most people. Simpler and less expensive methods include handheld electronic bioimpedance devices, and skinfold calipers. Of the two, calipers are considered to render results more consistent with hydrostatic weighing, but a degree of skill is required for accurate assessment. Skinfold measurements taken at seven sites on the body most accurately reflect hydrostatic values. According to exercise scientist Len Kravitz, PhD of the University of New Mexico, the values for optimal body composition vary, depending on your goals and gender. For men, optimal percent body fat ranges are five to 13 percent for athletes, 10 to 25 percent for optimal health, and 12 to 18 percent for optimal fitness. Men over 25 percent body fat are considered obese. Women naturally have higher values of body fat than men. Female athletes range from 12 to 22 percent, optimal health values are 18 to 30 percent, and body fat for optimal fitness ranges from 16 to 25 percent. Women over 30 percent body fat are considered obese. To determine your optimal fat to lean ratio and body weight, select a range based on your gender and goals. Use one of the available methods to assess your body fat percentage. Weigh yourself to determine your total body mass, or TBM, then multiply it by your body fat percentage, or BF% to get your fat weight, or FW. Subtract FW from TBM to get your lean body mass, or LBM. Divide LBM by one minus your goal body fat percentage, or GBF%, to get your target weight, or TW. Subtract TW from TBM to calculate how much weight you need to lose, or WL. The four-step formula looks like this: Step one: TBM x BF%=FW; Step 2: TBM – FW=LBM; Step 3: LBM/(1-GBF%) = TW; Step 4: TBM–TW=WL. How Does Body Mass Affect the Cardiovascular System?